There are two versions of this Reiner Knizia game: a normal edition and a limited edition. Only 750 copies were made for sale beginning on Nov 2002. 250 were made for the US, 250 for UK, and 250 for Germany. The costs of the game were $150 US, 150 UK pounds, and 350 dm. ---Box has same artwork but looks different and it is also signed by John Howe and Reiner Knizia. 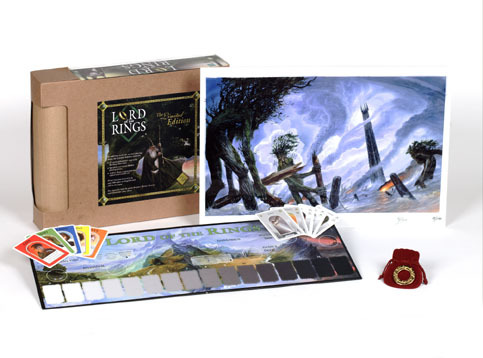 ---Includes a limited edition print signed by John Howe. ---The five hobbit pieces in the game are made of metal not plastic.